“The one who writes beautifully ‘In the name of God, the Merciful, the Compassionate’, will have his sins forgiven.” 1 Islam is the religion of the book. The Qurʾan for the Muslim is, therefore, the book par excellence and this fact is fundamental to an understanding of the Muslim religion and Islamic manuscriptmaking as a whole. 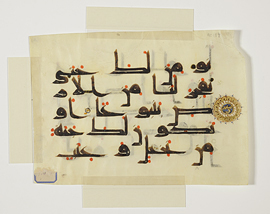 Although originally any addition of colored ink to the copied text of the Qurʾan was strictly prohibited, over time this book became the most decorated and cherished of all books among Muslims. A specific etiquette, applicable to both the reader and the scribe, grew around the process. The scribe, for instance, was required to be in a state of ritual purity (ṭahārah), wear clean clothes and face the Kaʿba (in Mecca) while engaged in copying the Book (al- Kitāb). The copying of the Qurʾan was very meritorious for the Muslim. In fact, it was regarded as an act of worship, which drew upon the calligrapher numerous blessings from God. 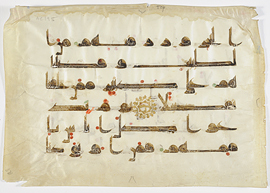 It is thus not surprising that calligraphers and illuminators, throughout the manuscript age, tried to surpass themselves in producing the most sumptuous copies of the Qurʾan. Some of the most visually stunning manuscripts of the Qurʾan were produced in the early Abbasid period (8th -10th centuries). 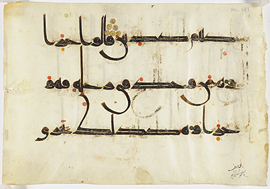 They exhibit a variety of calligraphic styles and decorations, as well as diacritical pointing by means of slanted strokes and vocalization using red dots. The horizontal-format manuscripts. 1 A tradition (ḥadīth) on the authority of Wahb ibn Munabbih (d.ca.732). 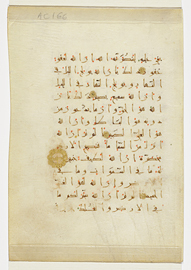 Qurʼan in Early Abbasid script. Qurʼan in the New Abbasid style. 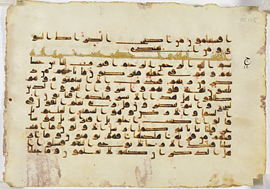 Qurʼan from the early Abbasid period.